Hundreds of animal right campaigners have taken to central London to demand the end of the fur trade in the UK. 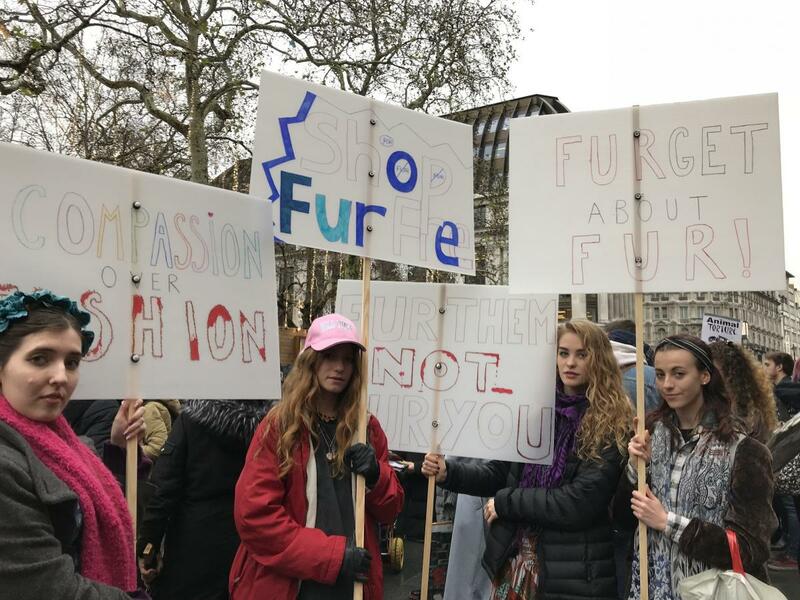 The campaigners marched from Leicester Square and onto Regents Street on Saturday afternoon, holding placards reading “F**k fur” and “End the fur trade”. The campaigners are calling for the end of the fur trade, including the importation of fur. Earlier this year, the Environment, Food and Rural Affairs Committee called for Parliament to consider a ban on the sale of real fur, after it found some real fur had actually been wrongly labelled as fake. Their inquiry in July came after it was found that retailers including TK Maxx, BooHoo, Amazon and Tesco had recently sold real fur as fake. Gabrielle Gordon from Shenley had never been to a protest before because she was “concerned about encouraging violence” but felt this march was an opportunity to change the minds of people walking by. Holding a placard reading “Furget about fur”, she said: “Having lots of people around you encourages you to go to a march more.